Ian Moore, BE, Ph.D. Sydney, FCAE, FEIC, FCSCE, P.Eng. 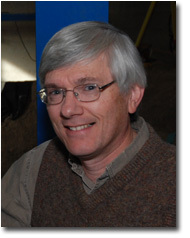 Dr. Moore is a Civil Engineer specializing in Geotechnical Engineering, Engineering Mechanics, Non-linear Soil-structure Interaction, and the Non-linear Mechanics of Shell Structures like pipes interacting with solids such as soil, employing both computational and experimental methods. His work includes research on stability limit states for long-span flexible culverts, buried pipes (concrete, steel, aluminum, polyethylene and PVC), manholes and buried tanks. Recent research includes continued development of design methods for thermoplastic, metal and concrete culverts, assessment of strength of corroded metal (corrugated steel and cast iron) pipes, behaviour of liners used to repair gravity flow and pressure pipelines, soil-pipe interaction during pipe bursting and horizontal directional drilling, behaviour and design of pipe joints and of continuous and jointed pipelines when subjected to differential ground movements. Moore, I.D., 1985. Analytical theory for buried tube postbuckling. Journal of Engineering Mechanics, American Society of Civil Engineers, Vol. 111, No. 7, pp. 936-951. Moore, I.D. and Booker, J.R., 1985. Simplified theory for the behaviour of buried flexible cylinders under the influence of uniform hoop compression. International Journal of Solids and Structures, Vol. 21, No. 9, pp. 929-941. Moore, I.D. and Booker, J.R., 1985. Behaviour of buried flexible cylinders under the influence of nonuniform hoop compression. International Journal of Solids and Structures, Vol. 21, No. 9, pp. 943-956. Moore, I.D. and Booker, J.R., 1987. Ground failure around buried tubes. International Journal of Rock Mechanics and Rock Engineering, Vol. 20, No. 4, pp. 243-260. Moore, I.D., 1987. The elastic stability of shallow buried tubes. Geotechnique, Vol. 37, No. 2, pp. 151-161. Moore, I.D., 1987. Response of buried cylinders to surface loads. Journal of Geotechnical Engineering, American Society of Civil Engineers, Vol. 113, No. 7, pp. 758-773. Ali, S., Moore, I.D. and Page, A.W., 1987. Substructuring technique in nonlinear analysis of brick masonry subjected to concentrated load. Computers and Structures, Vol. 27, No. 3, pp. 417-425. Moore, I.D., 1988. Static response of deeply buried elliptical tubes. Journal of Geotechnical Engineering, American Society of Civil Engineers, Vol. 114, No. 6, pp. 672-687. Moore, I.D., 1988. Elastic stability of buried elliptical tubes. Geotechnique, Vol. 38, No. 4, pp. 613-618. Moore, I.D., Purushothaman, N. and Heaton, B.S., 1988. Three dimensional elastic finite element study of the skid resistance of grooved pavement. International Journal for Numerical Methods in Engineering, Vol. 26, pp. 437-452. Purushothaman, N., Moore, I.D. and Heaton, B.S., 1988. Finite element analysis of viscoelastic solids responding to periodic disturbances. International Journal for Numerical Methods in Engineering, Vol. 26, No. 7, pp. 1471-1483. Moore, I.D., Selig, E.T. and Haggag, A., 1988. Elastic buckling strength of buried flexible culverts. Transportation Research Record No. 1191, Culverts and Tiebacks, pp. 57-64. Purushothaman, N., Heaton, B.S. and Moore, I.D., 1988. Experimental verification of a finite element contact analysis. Journal of Testing and Evaluation, American Society for Testing and Materials, Vol. 16, No. 4, pp. 497-507. Moore, I.D. and Rowe, R.K., 1988. Numerical models for evaluating progressive failure in earth structures - a review. Computers and Geotechnics, Vol. 6, No. 3, pp. 217-240. Moore, I.D., 1989. Elastic buckling of buried flexible tubes - a review of theory and experiment. Journal of Geotechnical Engineering, American Society of Civil Engineers, Vol. 115, No. 3, pp. 340-358. Purushothaman, N., Heaton, B.S. and Moore, I.D., 1990. A numerical analysis of the friction mechanism of grooved road surfaces. Surface Characteristics of Roadways: International Research and Technologies, ASTM STP 1031 (Eds. W.E. Meyer and J. Reichert), American Society for Testing and Materials, Philadelphia, pp. 127-137. Moore, I.D., 1990. Vibration of thick elastic and viscoelastic tubes. I - Harmonic response. Journal of Engineering Mechanics, American Society of Civil Engineers, Vol. 116, No. 4, pp. 928-942. Moore, I.D., 1990. Vibration of thick elastic and viscoelastic tubes. II - Response to patch loading. Journal of Engineering Mechanics, American Society of Civil Engineers, Vol. 116, No. 4, pp. 943-958. Moore, I.D., 1990. Three dimensional response of elastic tubes. International Journal of Solids and Structures, Vol. 26, No. 4, pp. 391-400. Moore, I.D., 1990, Influence of rib stiffeners on the buckling strength of elastically supported tubes. International Journal of Solids and Structures, Vol. 26, No. 5/6, pp. 539-547. Moore, I.D. and Selig, E.T., 1990. Use of continuum buckling theory for evaluation of buried plastic pipe stabilityBuried Plastic Pipe Technology, ASTM STP 1093, George S. Buczala and Michael J. Cassady, Eds., American Society for Testing and Materials, Philadelphia, pp. 344-359. Purushothaman, N. and Moore, I.D., 1990. Hysteresis sliding friction of rubber - finite element analysis. Journal of Engineering Mechanics, American Society of Civil Engineers, Vol. 116, No. 1, pp. 217-232. Moore, I.D., 1992. Spurious bifurcation modes for cohesive solids under uniform stress. International Journal for Numerical and Analytical Methods in Geomechanics, Vol. 16, pp. 439-451. Kodikara, J.K. and Moore, I.D., 1992. Nonlinear interaction of solids with rigid surfaces. Computers and Structures, Vol. 43, No. 1, pp. 85-91. Kodikara, J.K. and Moore, I.D., 1993. A general interaction analysis for large deformations. International Journal for Numerical Methods in Engineering, Vol. 36, No. 17, pp. 2863-2876. Kodikara, J.K. and Moore, I.D., 1993. Axial response of tapered piles in cohesive frictional ground. Journal of Geotechnical Engineering, American Society of Civil Engineers, Vol. 119, No. 4, pp. 675-693. Moore, I.D., 1994. Local strain in corrugated pipe: experimental measurements to test a numerical model. Journal of Testing and Evaluation, ASTM Vol. 22, No. 2, pp. 132-138. Guan, F. and Moore I.D., 1994. Three-dimensional dynamic response of twin cavities due to travelling loads. Journal of Engineering Mechanics, American Society of Civil Engineers, Vol. 120, No. 4, pp. 637-651. Moore, I.D. and Brachman, Richard W., 1994. Three-dimensional analysis of flexible circular culverts. Journal of Geotechnical Engineering, American Society of Civil Engineers, Vol. 120, No. 10, pp. 1829-1844. Moore, I.D., 1994. Analysis of rib supports for circular tunnels in elastic ground. International Journal of Rock Mechanics and Rock Engineering, Vol. 27, No. 3, pp. 155-172. Moore, I.D., 1994. Profiled HDPE pipe response under parallel plate loading. In Special Technical Publication 1222, Buried Plastic Pipe Technology (Ed. D.L. Eckstein), ASTM, Philadelphia, pp. 25-40. Moore, I.D., Haggag, A. and Selig, E.T., 1994. Buckling strength of flexible cylinders with nonuniform elastic support. Intl. Journal of Solids and Structures, Vol. 31, No. 22, pp. 3041-3058. Guan, F., Moore, I.D. and Lin, G., 1994. Transient response of reservoir-dam-soil systems to earthquakes. International Journal for Numerical and Analytical Methods in Geomechanics, Vol. 18, No. 12, pp. 863-880. Moore, R.G., Bedell, P.R. and Moore, I.D., 1995. Investigation and assessment of long-span corrugated steel plate culverts. Journal of Performance of Constructed Facilities, American Society of Civil Engineers, Vol. 9, No. 2, May, pp. 85-102. Moore, R.G., Bedell, P.R. and Moore, I.D., 1995. Design and implementation of repairs to corrugated steel plate culverts. Journal of Performance of Constructed Facilities, American Society of Civil Engineers, Vol. 9, No. 2, May, pp. 103-116. Moore, I.D., 1995. Three dimensional response of deeply buried profiled polyethylene pipe. Transportation Research Record 1514, Design and Performance of Underground Pipe, pp. 49-58. Moore, I.D. and Hu, F., 1995. Response of high-density polyethylene pipe in hoop compression. Transportation Research Record 1514, Design and Performance of Underground Pipe, pp. 29-36. Moore, I.D. and Guan, F., 1996. Three-dimensional dynamic response of lined tunnels due to incident seismic waves. Earthquake Engineering and Structural Dynamics, Vol. 25, pp. 357-369. Moore, I.D. and Hu, F., 1996. Linear viscoelastic modelling of profiled high density polyethylene pipe. Canadian Journal of Civil Engineering, Vol. 23, No. 2, April, pp. 395-407. El Sawy, K. and Moore, I.D., 1996. A two level iterative FEM technique for rigorous solution of non-linear interaction problems under large deformations. Computers and Structures, Vol. 61, No. 1, pp. 43-54. Brachman, R.W.I., Moore, I.D. and Rowe, R.K., 1996. 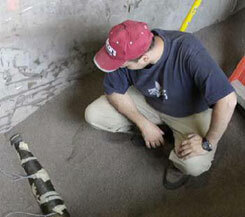 Interpretation of buried pipe test: Small-diameter pipe in Ohio University facility. Transportation Research Record 1541, pp. 64-70. Moore, I.D. and El-Sawy, K., 1996. Buckling strength of polymer liners used in sewer rehabilitation. Transportation Research Record 1541, pp. 127-132. Zhang, C. and Moore, I.D., 1997. Nonlinear mechanical response of high density polyethylene: Part I - Experimental investigation and model evaluation. Journal of Polymer Engineering and Science, Vol. 37, No. 2, pp. 404-413. Zhang, C. and Moore, I.D., 1997. Nonlinear mechanical response of high density polyethylene: Part II - Uniaxial constitutive modelling. Journal of Polymer Engineering and Science, Vol. 37, No. 2, pp. 414-420. Guan, F. and Moore, I.D., 1997. New techniques for modelling reservoir-dam and foundation-dam interaction. Soil Dynamics and Earthquake Engineering, Vol. 16, No. 4, pp. 285-293. Zhang, C. and Moore, I.D., 1997. Finite element modelling of inelastic deformation of ductile polymers. Geosynthetics International, Vol. 4, No. 2, pp. 137-163. Guan, F., Moore, I.D. and Spyrakos, C.C., 1998. Two dimensional transient fundamental solution due to suddenly applied load in a half-space. Soil Dynamics and Earthquake Engineering, Vol. 17, No. 4, pp. 269-277. Zhang, C. and Moore, I.D., 1998. Nonlinear finite element analysis for thermoplastic pipes. Transportation Research Record No. 1624, Structural Analysis and Design in Bridges, Culverts and Pipes. National Research Council, Washington, pp. 225-230. Moore, I.D. and Zhang, C., 1998. Nonlinear predictions for HDPE pipe response under parallel plate loading. Journal of Transportation Engineering, ASCE, Vol. 124, No. 3, pp. 286-292. El-Sawy, K. and Moore, I.D., 1998. Stability of loosely fitted liners used to rehabilitate rigid pipes. Journal of Structural Engineering, ASCE, Vol. 124, No. 11, November, pp. 1350-1357. Brachman, R.W.I. and Moore, I.D, 1999. Numerical integration during Fourier Integral Analysis. International Journal of Numerical and Analytical Methods in Geomechanics, Vol. 23, No. 12, pp. 1309-1318. Taleb, B. and Moore, I.D., 1999. Metal culvert response to earth loading performance of two-dimensional analysis. Transportation Research Record No. 1656, Underground and Other Structural Design Issues. National Research Council, Washington, pp. 25-36. Moore, I.D. and B. Taleb, 1999. Metal culvert response to live loading Performance of three-dimensional analysis. Transportation Research Record No. 1656, Underground and Other Structural Design Issues. National Research Council, Washington, pp. 37-44. Brachman, R.W.I., Moore, I.D. and Rowe, R.K., 2000. The design of a laboratory facility for evaluating the structural response of small-diameter buried pipes. Canadian Geotechnical Journal, Vol. 37, No. 2, April, pp. 281-295. Tognon, A.R., Rowe, R.K. and Moore, I.D., 2000. Geomembrane strain observed in large-scale testing of protection layers. Journal of Geotechnical and Geoenvironmental Engineering, Vol. 126, No. 12, December, pp. 1194-1208. Brachman, R.W.I., Moore, I.D. and Rowe, R.K., 2001. The performance of a laboratory facility for evaluating the structural response of small diameter buried pipes. Canadian Geotechnical Journal, Vol. 38, pp. 260-275. Brachman, R.W.I., Moore, I.D. and Rowe, R.K., 2001. Local Strain on a Leachate Collection Pipe. Canadian Journal of Civil Engineering. Vol. 27, No. 6, pp. 1273-1285. Dhar, A.S. and Moore, I.D. 2001. Liner buckling in profiled polyethylene pipes, Geosynthetics International, Vol. 8, No. 4, pp. 303-326. Dhar, A.S. and Moore, I.D. 2002. Corrugated High Density Polyethylene pipe: laboratory evaluation of two-dimensional analyses for limit states design. Transportation Research Record, No. 1814, 157-163. Law, T.C.M and Moore, I.D. 2003. Response of repaired sewers under earth loads, Transportation Research Record, No. 1845, pp. 173-181. Baumert, M.E., Allouche, E.N., and Moore, I.D., 2004. Experimental Investigation of Pull Loads and Borehole Pressures During Horizontal Directional Drilling Instllations, CGJ Vol 41 672-685. Dhar, A.S., Moore, I.D. and McGrath, T.J. 2004. Two-Dimensional Analysis of Thermoplastic Culvert Deformations and Strains, Journal of Geotechnical and Geo-environmental Engineering, ASCE, Vol. 130, No. 2, pp. 199-208. Dhar, A.S., Moore, I.D. 2004. Laboratory Investigation of Local Bending in Profiled Thermoplastic Pipes, Advances in Structural Engineering Journal, Vol. 7, No. 3, June 2004, pp. 201-215. Moore, I.D., Lapos, B., and Mills, C. 2004. Biaxial Testing to Investigate Soil-Pipe Interaction of Buried Fiber-Reinforced Cement Pipe, Journal of the Transportation Research Board, No. 1868, TRB, National Research Council, Washington D.C., 2004, pp. 169 - 176. Abdel-Fattah, M.T., Moore, I.D., and Abdel-Fattah, T.T. 2005. A Numerical Investigation into the Behaviour of Ground-supported Concrete Silos Filled with Saturated Solids, Int. Journal of Solids and Structures, Vol. 43, 3723 - 3738. Baumert, M.E., Allouche, E.J., and Moore, I.D. 2005. Drilling Fluid Considerations in Design of Engineered Horizontal Directional Drilling Installations, Int. Journal of Geomechanics, ASCE, 2005, Vol. 5, No. 4, 339-349. Hawlader, B.C., Lo, K.Y., and Moore, I.D. 2005. Analysis of Tunnels in Shaly Rock Considering three-dimensional Stress Effects on Swelling, Canadian Geotechnical Journal, Vol. 42, pp 1 - 12. Abdel-Fattah, M.T., Moore, I.D., and Abdel-Fattah, T.T. 2006. Behaviour of Elevated Concrete Silos Filled with Saturated Solids, Canadian Journal of Civil Engineering, Vol. 33, No.3, 227 - 239. Chehab, A.G., and Moore, I.D., 2006. Constitutive Model for High Density Polyethylene to Capture strain Reversal, ASCE Pipelines, 2006. 15419. Dhar, A.S., and Moore, I.D., 2006. Evaluation of Local Bending in Profile-Wall Polyethylene Pipes, Journal of Transportation Engineering, Vol. 132, No. 11, 898 - 906. Kennedy, M.J., Moore, I.D., and Skinner, G.D. 2006. Development of Tensile Hoop Stress during Horizontal Directional Drilling through Sand, Int. Journal of Geomechanics, Vol. 6, No. 5, 367-373. Kennedy, M.J., Skinner, G.D., and Moore, I.D. 2006. Limiting Slurry Pressures to Control Hydraulic Fracturing in Directional Drilling Operations in Purely Cohesive Soil, Transportation Research Record, No. 1976, pp 172 - 180. Kennedy, M.J., Skinner, G.D., and Moore, I.D., 2006. Limiting Slurry pressures to Control Hydraulic Fracturing in Directional Drilling Operations in Purely Cohesive Soil. TRR No. 1976, pp. 172-180. Wong, L.S., Allouche, E.N., Dhar, A.S., Baumert, M., and Moore, I.D. 2006. Long-term monitoring of SIDD Type IV installations, CGJ 43: 392-408. Xia, H. and Moore, I.D. 2006. Estimation of Maximum Mud Pressure in Purely Cohesive Material during Directional Drilling, Geomechanics and Geotechnical, Vol. 1, pp. 3-11. Lapos, B.M., Brachman, R.W.I., and Moore, I.D., 2007. Response to Overburden Pressure of an HDPE pipe Pulled in place by Pipebursting, CGJ, Vol 44, p 957-965. Law, T.C.M. and Moore, I.D., 2007. Installed Geometry of Cast-in-Place Polymer Sewer Liners. JPCF March/April 2007, P 172-176. Law, T.C.M., and Moore, I.D., 2007. Numerical Modelling of tight fitting flexible liner in damaged sewer under earth loads, TUST, Vol. 22, (2007), p. 655-665. Nkemitag, M., and Moore, I.D., 2007. Longitudinal Progression of the Burst Head During Pipe Bursting: Calculation of pulling force, TRB 07-1225 24p. Trickey, S.A., and Moore, I.D., 2007. 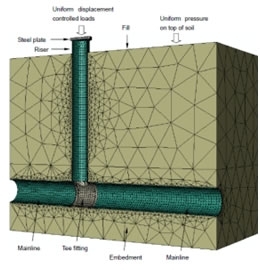 Three-Dimensional Response of Buried Pipes Under Cicular Surface Laoding, ASCE JGGE Vol. 133, No. 2 p219-223. Brachman, R.W.I., Moore, I.D. and Munro, S.M. 2008. Compaction effects on strains in thermoplastic culverts, Geosynthetics International, 15(2), 72-85. Brown, M., Fam, A. and Moore, I.D. 2008. Material Characterization of a Composite Polymer Liner for Rehabilitation of Pressure Pipelines, Polymer Engineering and Science, 48(7), 1231-1239. El-Taher, M. and Moore, I.D. 2008. Finite Element Study of Stability of Corroded Metal Culverts, TRR: Journal of the Transportation Research Board, No. 2050, pp 157-166. Balkaya, M., and Moore, I.D. 2009. Analysis of a gasketed PVC pipe-joint, Transportation Research Record, Transportation Research Board, Washington D.C. (Paper No. 09-3101), Number 2131, pp. 113-122. Cholewa, J., Brachman, R.W.I, Moore, I.D. and Take, W.A. 2009. Ground displacements from a pipe bursting experiment in well-graded sand and gravel. ASCE J. Geotechnical and Geoenvironmental Engineering, Vol.135(11), pp. 1713-1721..
Munro, S.M., Moore, I.D. and Brachman, R.W.I. 2009. Laboratory Testing to Examine Deformations and Moments in Fiber-Reinforced Cement Pipe, Journal of Geotechnical & Geoenvironmental Engineering, ASCE, Vol.135, No. 11, pp. 1722-1731. Ampiah, N.A., Fam, A. and Moore, I.D. 2010. Effect of wrinkles on circumferential strength of cast-in-place composite polymer liner used in retrofitting pressure pipes, ASCE, Journal of Materials in Civil Engineering, Vol. 22, No. 12. pp. 1304-1314. Brachman, R.B., Mak, A.C. and Moore, I.D. 2010. Ultimate limit state of a deep-corrugated large-span box culvert, Transportation Research Record, No. 2201: 55-61. Brachman, R.W.I., McLeod, H.A., Moore, I.D. and Take, A.W.A. 2010 Three-dimensional ground displacements from static pipe bursting in stiff clay, Canadian Geotechnical Journal, Vol. 47(4), pp. 439-450. Chehab, A.G. and Moore, I.D. 2010. Parametric study examining the short and long term response of HDPE pipes when installed by horizontal directional drilling. Tunnelling and Underground Space Technology, Vol. 25, pp: 782-794. Cholewa, J., Brachman, R.W.I. & Moore, I.D. 2010. Effectiveness of Viscoelastic Models for Prediction of Tensile Axial Strains during Cyclic Loading of High-Density Polyethylene Pipe, Journal of Pipeline Systems Engineering and Practice, ASCE, Vol. 1(2), pp. 77-83. Cholewa, J.A., Brachman, R.W.I. & Moore, I.D. 2010. Stress-strain measurements for HDPE pipe during and after simulated installation by horizontal directional drilling. Tunnelling and Underground Space Technology, Vol. 25, pp: 773-781. Jeong, H.-Y. and Moore, I.D. 2010. Calculations for central stress minimum under sand piles using continuum analysis, Zeitschrift für Angewandte Mathematik und Mechanik (J. for Applied Mathematics and Mechanics), Vol. 90, No. 1, pp. 65 -71. Moore, I.D., Brachman, R.B., Cholewa, J.A. and Chehab, A.G. 2010. Axial response of HDPE pipes as a result of installation by directional drilling, Journal of ASTM International, Vol. 8, Issue 3, 10pp. Saiyar, M. W. Take, W.A., and Moore, I.D. 2011. Validation of boundary PIV measurements of soil-pipe interaction, International Journal of Physical Modelling in Geotechnics,Volume 11, Issue 1, pages23-32. Cholewa, J.A., Brachman, R.W.I. & Moore, I.D. 2011. Axial stress-strain response of HDPE from whole pipes and coupons, ASCE. Journal of Materials in Civil Engineering Volume 23, Number 10, pages 1377-1386. Talesnick, M.L., Xia, H.W. and Moore, I.D. 2011. Earth pressure measurements on buried HDPE pipe, Géotechnique, Volume 61, Issue 9, pages 721 - 732. Balkaya, M., Moore, I.D. and Saglamer, A. 2012. Study of non-uniform bedding support due to erosion under cast iron water distribution pipes, Journal of Geotechnical and Geoenvironmental Engineering, Vol. 138, No. 10, pp. 1247–1256. Balkaya, M., Moore, I.D. and Saglamer, A. 2012. Study of non-uniform bedding due to voids under jointed PVC water distribution pipes, Geotextiles and Geomembranes, Volume 34, No. 1, October 2012, pp. 39–50. Balkaya, M., Saglamer, A. and Moore, I.D. 2012. Conta baglantili PVC borularin deformasyon davranisinin laboratuvar deneyleri ile belirlenmesi (“Laboratory experiments to determine the deformation behavior associated with gasketed PVC pipes”). ITÜDERGISI/d, Vol. 10 (4). Brachman, R.W.B., Elshimi, T., Mak, A. and Moore, I.D. 2012. Testing and Analysis of a Deep-corrugated Large-span Box Culvert Prior to Burial, Journal of Bridge Engineering, ASCE, J. Bridge Eng., Vol. 17, No. 1, pp. 81–88. Chehab, A.G. and Moore, I.D. 2012. Analysis for Long Term Response of Pipes Installed Using Horizontal Directional Drilling, Journal of Geotechnical and Geoenvironmental Engineering, ASCE, Vol. 138, No. 4, pp. 432–440. Almahakeri, M., Fam, A. and Moore, I.D. 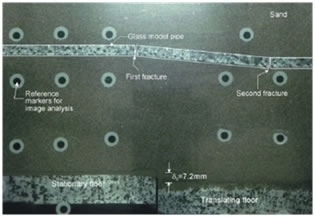 2013 Longitudinal Bending and Failure of GFRP Pipes Buried in Dense Sand under Relative Ground Movement, Journal of Composites for Construction, ASCE , Vol. 17:702-710, September. Balkaya, M., Moore, I.D. and Saglamer, A. 2013. Study of non-uniform bedding support under continuous PVC water distribution pipes, Tunnelling and Underground Space Technology, Vol. 35, No. 1 of 1, pp. 99-108, April, doi:10.1016/j.tust.2012.12.005. Becerril García, D. and Moore, I.D. 2013. Behavior of Bell and Spigot Joints in Buried Thermoplastic Pipelines, Transportation Research Record, Vol. 2332, pp. 29-40. Elshimi, T. and Moore, I.D. 2013. Modeling the effects of backfilling and soil compaction beside shallow buried pipes, Journal of Pipeline Systems Engineering and Management, ASCE, Vol. 4(4), 04013004, 1-7. Almahakeri, M., Fam, A. and Moore, I.D. 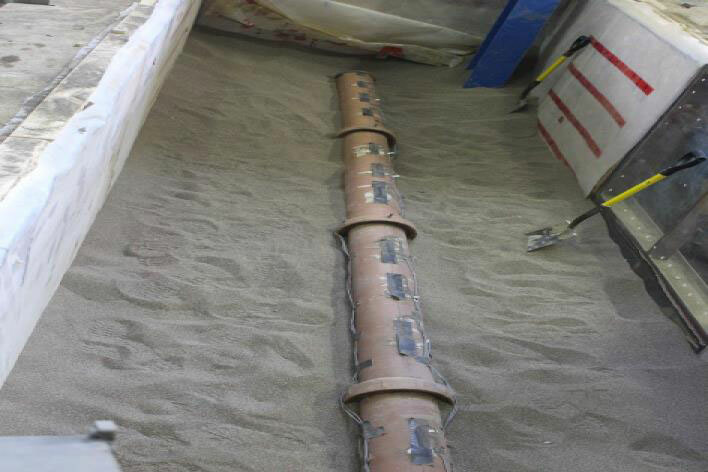 2014 Experimental Investigation of Longitudinal Bending of Buried Steel Pipes Pulled through Dense Sand, Journal of Pipeline Systems Engineering and Management, ASCE, Vol. 5, No. 2, 04013014, 1-10. Becerril García, D. and Moore, I.D. 2014. Behavior of Coupling Band Joints in Buried Corrugated Steel Culverts, Journal of Geotechnical and Geoenvironmental Engineering, ASCE, Vol. 140, No. 2, 04013014, pp. 1-9. Brown, M., Moore, I.D. and Fam, A. 2014. 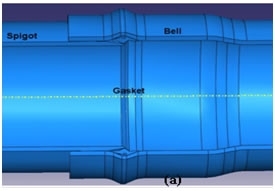 Performance of a Cured-in-Place Pressure Pipe Liner Passing Through a Pipe Section Without Structural Integrity, Tunnelling and Underground Space Technology, Vol. 42 pp. 87-95, doi:10.1016/j.tust.2014.01.005. Elshimi, T., Brachman, R.W.I. and Moore, I.D. 2014. Effect of truck position and multiple truck loading on response of long-span metal culverts, Canadian Geotechnical Journal, Vol. 51, pp. 196-207 doi: 10.1139/cgj-2013-017. Mai, V.T., Hoult, N.A. and Moore, I.D. 2014. Effect of Deterioration on the Performance of Corrugated Steel Culverts, Journal of Geotechnical and Geoenvironmental Engineering, ASCE, Vol. 140, No. 2, 04013007, pp. 1-11. Mai, V.T., Hoult, N.A. and Moore, I.D. 2014. Performance of Two-Dimensional Analysis: Deteriorated Metal Culverts under Surface Live Load, Tunnelling and Underground Space Technology, Vol. 42, pp. 152-160, doi:10.1016/j.tust.2014.02.015. Sheldon, T., Sezen, H. and Moore, I.D. 2014. Joint Response of Existing Pipe Culverts under Surface Live Loads, J of Perf. of Constructed Facilities, ASCE, 04014037, 1-8. Simpson, B., Hoult, N.A. and Moore, I.D. 2014. Distributed Sensing of Circumferential Strain using Fiber Optics during Full-scale Buried Pipe Experiments, J. Pipeline Systems Eng. and Management, 10.1061/(ASCE)PS.1949-1204.0000197, 04015002. Wang, Y., and Moore, I.D. 2014. Simplified design equations for joints in buried flexible pipes based on the Hetényi solutions, Journal of Geotechnical and Geoenvironmental Engineering, ASCE, Vol. 140, No. 3, 04013020, 1-14. Becerril García, D. and Moore, I.D. 2015. Behaviour of bell and spigot joints in buried reinforced concrete pipes, Canadian Geotechnical Journal, Vol. 52, No. 5, pp. 609-625, doi: 10.1139/cgj-2013-0072. Becerril García, D. and Moore, I.D. 2015. Performance of Deteriorated Corrugated Steel Culverts Rehabilitated with Sprayed-on Cementitious Liners Subjected to Surface Loads, Tunnelling and Underground Space Technology, Vol. 47, No. 3, pp. 222-232, doi:10.1016/j.tust.2014.12.012. MacDougall, K., Hoult, N. and Moore, I.D. 2015. Measured load capacity of buried reinforced concrete pipes, ACI Structural Journal, DOI: 10.14359/51688059. Moore, I.D. and Becerril García, D. 2015. Ultimate Strength Testing of Two Deteriorated Metal Culverts Rehabilitated With Spray-on Cementitious Liners, Transportation Research Record, No.2522, pp 139-147, DOI 10.3141/2522-14. Saiyar, M.S., Moore, I.D. and Take, W.A. 2015. Kinematics of Jointed Pipes and Design Estimates of Joint Rotation under Differential Ground Movements, Canadian Geotechnical Journal, 52(11): 1714-1724, doi 10.1139/cgj-2014-0347. Saiyar, M.S., Ni, P., Take, W.A., and Moore, I.D. 2015. Response of pipelines of differing flexural stiffness to normal faulting, Géotechnique, DOI: 10.1680/geot./14-P-175. Saiyar, M.S., Take, W.A. and Moore, I.D. 2015. Post-failure Fracture Angle of Brittle Pipes Subjected to Differential Ground Movements, Tunnelling and Und. Space Tech., doi: 10.1016/j.tust.2015.04.009. Sheldon, T., Sezen, H. and Moore, I.D. 2015. Beam-on-Springs Modeling of Jointed Pipe Culverts. J. Perform. Constr. Facil. , 10.1061/(ASCE)CF.1943-5509.0000729, 04015002. Simpson, B., Moore, I., and Hoult, N. 2015. Experimental Investigation of Rehabilitated Steel Culvert Performance under Static Surface Loading. J. Geotech. Geoenviron. Eng., 10.1061/(ASCE)GT.1943-5606.0001406 , 04015076. Smith, T., Hoult, N.A. and Moore, I.D. 2015. Role of Grout Strength and Liners on the Performance of Slip-lined Pipes, accepted for publication, J. Pipeline Systems Engineering and Practice, ASCE, 10.1061/(ASCE)PS.1949-1204.0000203 , 04015007. Trickey, S.A., Moore, I.D. and Balkaya, M. 2015. Parametric Study of Frost-Induced Bending Moments in Buried Cast Iron Water Pipes, Tunnelling & Underground Space Technology, DOI: 10.1016/j.tust.2015.10.028. Wang, Y. and Moore, I.D. 2015. Simplified design equations for rigid pipe joints based on the 2-pipe approximation, Canadian Geotechnical Journal, Vol. 52, No. 5, pp. 626-637, doi: 10.1139/cgj-2013-007. Wilson, D., Filion, Y.R. and Moore, I.D. 2015. Identifying factors that influence the factor of safety and probability of failure of large-diameter, cast iron water mains with a mechanistic stochastic model: a case study in the city of Hamilton. Procedia Engineering, 119, 130-138, doi:10.1016/j.proeng.2015.08.863. Becerril García, D. and Moore, I.D. 2016. Evaluation and Application of the Flexural Rigidity of a Reinforced Concrete Pipe. J. Pipeline Syst. Eng. Practice, 10.1061/(ASCE)PS.1949-1204.0000216, 04015015, Vol. 7, No. 1. Becerril García, D. and Moore, I.D. 2016. Rotational Characteristics of a Gasketed Bell and Spigot Joint in a Pressurized Reinforced Concrete Pipeline. J. Pipeline Syst. Eng. Pract., 10.1061/(ASCE)PS.1949-1204.0000209, 04015010, Vol. 7, No. 1. Saiyar, M.S., Ni, P., Take, W.A., and Moore, I.D. 2016. Response of pipelines of differing flexural stiffness to normal faulting, Géotechnique, 66(4), pp. 275–286¸DOI: 10.1680/geot./14-P-175. Regier, C., Hoult, N.A. and Moore, I.D. 2017. Laboratory Study on the Behavior of a Horizontal-Ellipse Culvert during Service and Ultimate Load Testing, J. Bridge Eng., Vol, 22, No. 3, DOI: 10.1061/(ASCE)BE.1943-5592.0001016, pp. 04016131-1 to 14. Ni, P., Moore, I.D. and Take, W.A. 2017. Distributed fibre optic sensing of strains on buried full-scale PVC pipelines crossing a normal fault, Géotechnique DOI: 10.1680/jgeot.16.P.161. Lan, H. and Moore, I.D. 2017. Numerical Investigation of the Circumferential Stresses Around Boreholes During Horizontal Directional Drilling, International Journal of Geomechanics. ASCE, Vol. 17, No. 12; DOI 10.1061/%28ASCE%29GM.1943-5622.0001011. Ni, P., Moore, I.D. and Take, W.A. 2017. Numerical modeling of normal fault-pipeline interaction and comparison with centrifuge tests, Soil Dynamics & Earthquake Eng., Vol. 105, No. 2, pp. 127-138, https://doi.org/10.1016/j.soildyn.2017.10.011. Tetreault, J., Moore, I.D., Hoult, N.A., Tanzil, D., Maher, M. 2018. Development of a Sustainability Evaluation System for Culvert Replacement and Rehabilitation Projects, J. Pipeline Systems Engineering and Management, ASCE, Vol. 9, No. 2, 04018004 doi: 10.1061/(ASCE)PS.1949-1204.0000315. Regier, C., Hoult, N.A. and Moore, I.D. 2018. Laboratory Study of the Remaining Strength of Deteriorated Corrugated Steel Culverts, J. Pipeline Systems Engineering and Management, ASCE, Vol. 9, No. 2, 04018002. Lan, H. and Moore, I.D. 2018. Practical Criteria for Assessment of Horizontal Borehole Instability in Saturated Clay, Tunnelling and Underground Space Technology. Vol. 75, pp. 21-35, https://doi.org/10.1016/j.tust.2018.02.002. Becerril García, D. and Moore, I.D. 2018. Leakage Performance of Joints in Gravity Flow Pipes Subjected to Shear Force, Angular Misalignment and/or Diameter Deformation, Journal of Testing and Evaluation, ASTM, Paper JTE-2017-0419, accepted for publication, January 3rd, 2018. Roy, K., Hawlader, B., Kenny, S. and Moore, I. 2018. 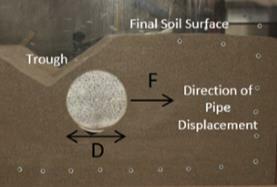 Uplift Failure Mechanisms of Pipes Buried in Dense Sand Kshama Roy, International Journal of Geomechanics, Vol. 18, No. 8, 04018087:1-13, DOI: 10.1061/(ASCE)GM.1943-5622.0001226..
Roy, K., Hawlader, B., Kenny, S. and Moore, I. 2018. Upward Pipe-Soil Interaction for Shallowly Buried Pipelines in Dense Sand. Journal of Geotechnical and Geoenvironmental Engineering, accepted for publication, April. Mai, T.V., Hoult, N.A. and Moore, I.D. 2018. Design and performance of a deeply buried pipe testing facility, Advances in Structural Engineering, Special Issue in Honour of Michael Rotter, accepted for publication May 8th, 2018. Moore, I.D. and Selig, E.T., 1990. Use of continuum buckling theory for evaluation of buried plastic pipe stability. Buried Plastic Pipe Technology, ASTM STP 1093, George S. Buczala and Michael J. Cassady, Eds., American Society for Testing and Materials, Philadelphia, pp. 344-359. Moore, I.D., 1993. Design of piled foundations. Contribution to Chapters 19 and 20 of the Canadian Foundation Engineering Manual. Moore, I.D. 2001. Culverts and buried pipelines. Chapter 18 of the Geotechnical and Geoenvironmental Handbook, pp. 541-568, Edited by R.K. Rowe, Kluwer Academic Publishers. McGrath, T.J. Selig, E.T. Moore, I.D. Webb, M.C and Taleb, B. 2002. Recommended Specifications for Large-Span Culverts, NCHRP Report 473, Transportation Research Board, Washington D.C. 47pp. McGrath, T.J., Moore, I.D. and Hsuan, G.Y. 2009 Updated Test and Design Methods for Thermoplastic Drainage Pipe, NCHRP Report 631, Transportation Research Board, Washington D.C. 310pp. Moore, I.D., Becerril Garcia, D., Sezen, H. and Sheldon, T. (2012) Structural design requirements for culvert joints, NCHRP Web-only document 190, Contractor’s Final Report for NCHRP Project 15-38, April 2012 Transportation Research Board, Washington D.C.
Moore, I.D., Hoult, N.A. and MacDougall, K. (2014) Establishmentof Appropriate Guidelines for Use of the Direct and Indirect Design Methods for Reinforced Concrete Pipe, Contractor’s Final Report for NCHRP Project 20-07 Task 316, March 2014 (June 2014 update) National Cooperative Highway Research Program, National Academy of Sciences Transportation Research Board, Washington D.C.126 pp. Moore I.D. and Becerril García, D. (2015) Test methods for watertightness of culvert joints, Final project report, NCHRP 20-07 Task 347, 159pp. Maher, M., Hebeler, G., Fuggle, A., Caywood, C., VanKerkhove, K.A.J., Moore, I.D. (2015) Proposed Practice for Alternative Bidding of Highway Drainage Systems, NCHRP REPORT 801, 145pp. Moore, I.D. and Booker, J.R., 1982. A circular boundary element for the analysis of deep tunnels. Proc. Fourth International Conference on Numerical Methods in Geomechanics, Edmonton, Canada, Vol. 1, pp. 53-60. Moore, I.D., 1984. Postbuckling of buried flexible tubes. Proc. Ninth Australian Conference on the Mechanics of Structures and Materials, University of Sydney, Australia, pp. 61-66. Moore, I.D., 1986. The response of buried cylinders to surface loads. Proc. Tenth Australian Conference on the Mechanics of Structures and Materials, University of Adelaide, Australia, Vol. 1, pp. 69-74. Moore, I.D., Purushothaman, N. and Heaton, B.S., 1986. Simplified three dimensional finite element procedure for the analysis of the skid resistance of grooved pavement. Proc. Thirteenth Australian Road Research Board Conference, University of Adelaide, Australia, Vol. 5, pp. 184-191. Purushothaman, N. and Moore, I.D., 1987. Finite element analysis of a viscoelastic solid sliding over rigid triangular asperities. Proc. Second International Conference on Advances in Numerical Methods in Engineering, University College of Swansea, Wales, Vol. 1, No. D56/1-8. Moore, I.D., 1988. Performance of a buckling theory for metal culverts. Proc. Fifth Australian/New Zealand Conference on Geomechanics, Sydney, Australia, pp. 305-308. Moore, I.D., 1988. Buckling of buried flexible structures of noncircular shape. Proc. Sixth International Conference on Numerical Methods in Geomechanics, Innsbruck, Austria, Vol. 2, pp. 1079-1084. Moore, I.D. and Booker, J.R., 1989. Geometrically nonlinear analysis of buried cylinders. Proc. Third International Symposium on Numerical Models in Geomechanics, Niagara, Canada, pp. 716-723. Moore, I.D. and Rowe, R.K., 1990. Scaling rule for localised plasticity in strain-softening continua. In Computational Mechanics (Eds.) C.A. Brebbia, M.H. Aliabadi and D.J. Cartwright, Proc. First International Conference on Computer-Aided Assessment and Control of Localised Damage, Portsmouth, England, June 1990, Vol. 2, pp. 99-112. Moore, I.D., 1991. Scaling localised plasticity using mesh triangulation. Proc. International Conference on Nonlinear Engineering Computations, Swansea, Wales, Sept. 1991, pp. 393-402. Pineridge Press. Moore, I.D. and Rowe, R.K., 1991. Objective solutions for bearing capacity of strain-softening soils. Proc. Seventh International Conference on Computer Methods and Advances in Geomechanics, (Eds. G. Beer, J.R. Booker and J.P. Carter), Cairns, Australia, May 1991, Vol. 2, pp. 1183-1189. A.A. Balkema. Kodikara, J.K. and Moore, I.D., 1991. A versatile interaction analysis for nonlinear bodies. Proc. Seventh International Conference on Computer Methods and Advances in Geomechanics, Cairns, Australia. Eds. G. Beer, J.R. Booker and J.P. Carter, Vol. 2, pp. 1171-1176. A.A. Balkema. Kodikara, J.K. and Moore, I.D., 1991. Snap-buckling of an embedded circular tube under distributed loading. Proc. International Conference on Nonlinear Engineering Computations, Swansea, Wales, September, pp. 205-214. Moore, I.D. and Rowe, R.K., 1992. Objective strain-softening solutions using lower order finite elements. Proc. Third International Conference on Computational Plasticity: Fundamentals and Applications, Barcelona, Spain, April, Vol. 1, pp. 645-656. Moore, I.D., 1993. HDPE pipe for burial under landfills. Sardinia 92, Fourth Intl. Landfill Symposium, Cagliari, Italy, October, pp. 1473-1482. Guan, F., Moore, I.D. and Lin, G., 1994. Seismic analysis of reservoir-dam-soil systems in the time domain. In: Proceedings of the Eighth International Conference on Computer Methods and Advances in Geomechanics, Morgantown, WV, U.S.A., May 1994, (Eds.) H.J. Siriwardane and M.M. Zaman, A.A. Balkema, Vol. 2, pp. 917-922. Moore, I.D., 1994. Three dimensional time dependent models for buried HDPE pipe. In: Proceedings of the Eighth International Conference on Computer Methods and Advances in Geomechanics, Morgantown, WV, U.S.A., May 1994, (Eds.) H.J. Siriwardane and M.M. Zaman, A.A. Balkema, Vol. 2, pp. 1515-1520. Moore, I.D., 1994. Three dimensional response of a shallow buried metal culvert. In: Developments in Short and Medium Span Bridge Engineering '94, Eds. Mufti, Bakht & Jaeger, pp. 95-105. Proceedings of the 4th International Conference on Short and Medium Span Bridges, Halifax, Nova Scotia, August 1994. Moore, I.D., 1995. Three dimensional response of deeply buried profiled polyethylene pipe. 74th Annual Meeting, Transportation Research Board, Jan. 22-28, 1995, Washington, D.C. Preprint Paper No. 95-0822, pp. 1-20. Moore, I.D. and Hu, F., 1995. Response of profiled HDPE pipe in hoop compression. 74th Annual Meeting, Transportation Research Board, Jan. 22-28, 1995, Washington, D.C. Preprint Paper No. 95-0823, pp. 1-20. Moore, I.D. and Hu, F., 1995. Significance of time dependent HDPE pipe response. Proc. 1995 Annual Conference of the Canadian Society for Civil Engineering, June 1-3, Ottawa, Ontario, pp. 555-564. Brachman, R.W.1, Moore, I.D. and Rowe, R.K., 1996. Interpretation of a buried pipe test: Small diameter pipe in the Ohio University facility. 75th Annual Meeting, Transportation Research Board, Washington, D.C., January 7-11, 1996. Preprint Paper No. 96-0812, 20 p.
Moore, I.D. and El Sawy, K., 1996. Buckling strength of polymer liners used in sewer rehabilitation. 75th Annual Meeting, Transportation Research Board, Washington, D.C., January 7-11, 1996. Preprint Paper No. 96-0813, 21 p.
Brachman, R.W.I., Moore, I.D. and Rowe, R.K., 1996. A new laboratory facility for evaluating the performance of small diameter buried pipes. Proc. 1996 Annual Conference of the Canadian Society for Civil Engineering, May 29-June 1, Edmonton, Alberta, pp. 72-83. Moore, I.D., 1996. Local buckling in profiled HDPE pipes. Proc. 1996 Annual Conference of the Canadian Society for Civil Engineering, May 29-June 1, Edmonton, Alberta, pp. 84-94. Moore, I.D., Laidlaw, T.C. and Brachman, R.W.I., 1996. Test cells for static pipe response under deep burial. Proc. 49th Canadian Geotechnical Conference, St. John's, Newfoundland, Sept. 23-25, 1996, pp. 737-744. Moore, I.D. and Laidlaw, T.C., 1997. 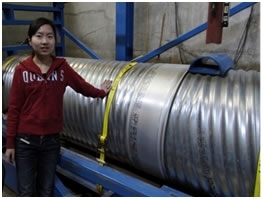 Corrugation buckling in HDPE pipes - measurements and analysis. 76th Annual Meeting, Transportation Research Board, Washington, D.C., January 11-15, 1997. Preprint Paper No. 97-0565, 24 p.
El Sawy, K. and Moore, I.D., 1997. Parametric study for buckling of liners: effect of liner geometry and imperfections. In: Trenchless Pipeline Projects - Practical Applications. Proc. Intl. Conf., Boston, Mass., June 8-11, sponsored by the Pipeline Division, ASCE, pp. 416-423. Zhang, C. and Moore, I.D., 1997. Finite element modeling of non-linear time-dependent behavior of high density polyethylene. In: ANTEC '97, Proc. Annual Technical Conference, The Society of Plastic Engineers, Toronto, Canada, April 26 - May 2, 1997, pp. 3280-3284. Brachman, R.W.I., Rowe, R.K. and Moore, I.D., 1997. Laboratory testing of perforated leachate collection pipes. Proc. Annual Conference of the Canadian Society for Civil Engineering, Sherbrooke, Québec, May 27-30, 1997, pp. 113-122. El Sawy, K., Moore, I.D. and Taleb, B., 1997. Analysis of stability limit states for long span culverts. Proc. 50th Canadian Geotechnical Conference, Ottawa, October 20-22, 1997, pp. 178-184. Zhang, C. and Moore, I.D., 1997. Nonlinear finite element modeling of HDPE geosynthetics. Proc. 50th Canadian Geotechnical Conference, Ottawa, October 20-22, 1997, pp. 304-311. Zhang, C. and Moore, I.D., 1998. Non-linear finite element analysis for thermoplastic pipes. 77th Annual Meeting, Transportation Research Board, Washington, D.C., January 11-15, 1998. Preprint Paper No. 98-0701, 27 p.
Moore, I.D., Brachman, R.W.I., Rowe, R.K. and Tognon, A., 1998. Analysis of pipe structures in soil test cells - biaxial pipe testing at The University of Western Ontario. 77th Annual Meeting, Transportation Research Board, Washington, D.C., January 11-15, 1998. Preprint Paper No. 98-1563, 17 p.
Brachman, R.W.I., Rowe, R.K., Moore, I.D. and Tognon, A.R.M., 1998. Laboratory investigation of the effect of coarse stone backfill on the performance of leachate collection pipe. Proc. 6th International Conference on Geosynthetics, 1998, Atlanta, Georgia, March 25-29, 1998, Vol. 1. pp. 191-196. Moore, I.D., 1998. Tests for pipe liner stability: What we can and cannot learn. Proc. North American NO-DIG '98 Conference, Albuquerque, NM, April (North American Society for Trenchless Technology), pp. 444-457. Rotter, J.M., Moore, I.D., Ooi, J.Y., Holst, J.M.F.G. and Stove, A.D., 1998. 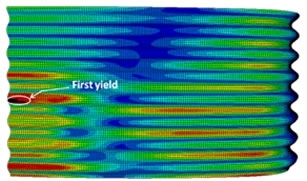 Effect of non-uniform wall friction on filling pressures in silos. Proc. 6th International Conference on Bulk Materials Storage, Handling and Transportation, Wollongong NSW, Australia, September 28-30, 1998, pp. 425-433. Brachman, R.W.I., Moore, I.D., Lo, K.Y. and Ansari, N., 1998. Analysis and performance of a shoring system with tie-back anchors. Proc. 51st Canadian Geotechnical Conference, Edmonton, Alberta, Oct. 4-7, 1998, Vol. I, pp. 439-446. Taleb, B. and Moore, I.D., 1999. Metal culvert response to earth loading Performance of two-dimensional analysis. 78th Annual Meeting of the Transportation Research Board, Washington D.C., January 10-14, 1999, Paper No. 990532. Moore, I.D., 1999. Thermoplastic pipes: Latest studies on sewer, drainage and culvert products. Proc. INFRA99 International, Center for Expertise and Research on Infrastructure in Urban Areas, Montreal, November 22-24, Session 4B, 16 p.
Law, T.C.M. and Moore, I.D., 2000. Static response of slip-lined sewers. Proc. North American NO-DIG 2000, Anaheim, California, April 9-12, pp. 49-56. Brachman, R.W.I., Rowe, R.K. and Moore, I.D., 2000. Drainage pipes for landfill leachate collection systems. Proc. CSCE London 2000 Conference, 6th Environmental Engineering Specialty Conference of the Canadian Geotechnical Society, London, Ont., June 7-10, pp. 82-88. Taleb, B. and Moore, I.D., 2000. Three dimensional bending in long span culverts. Proc. Annual Conference of the Canadian Geotechnical Society, Regina, pp. 305-312. Moore, I.D., 2000. Performance limits for polymer sewer liners. Proc. Annual Conference of the Canadian Geotechnical Society, Regina, pp. 357-362. Abdel-Fattah, M. and Moore, I.D., 2000. Buckling characteristics of cylindrical elastic core Proc. CSCE London 2000 Conference, 3rd Structural Specialty Conference, London, Ont., June 7-10, pp. 530-536. Law, T.C.M., Moore, I.D. and D'Andrea, M., 2000. Structural response of slip-lined sewers. Proc. CSCE London 2000 Conference, 3rd Structural Specialty Conference, London, Ont., June 7-10, pp. 349-354. Dhar, A.S. and Moore, I.D., 2000. Local buckling in profiled thermoplastic pipes. Proc. CSCE London 2000 Conference, Annual conference of the Canadian Society for Civil Engineering, London, Ont., June 7-10, pp. 368-375. Dhar, A.S. and Moore, I.D., 2000. Non-linear analysis of buried HDPE Pipe by the finite element method: comparison with laboratory test, Proceedings of GeoEng2000, Melbourne, Australia. Fernando, V. and Moore, I.D. 2001. Installation loads on new pipelines during pipe bursting, Underground Infrastructure Research Conference, Waterloo, Ontario, June. Dhar, A.S. and Moore, I.D. 2001. Limit states of buried thermoplastic pipes: laboratory investigations, Underground Infrastructure Research Conference, Waterloo, Ontario, June. Moore, I.D. and Allouche, E.N. 2001. Masters and doctoral research at the University of Western Ontario, Proceedings of the North American No-Dig 2001 Conference, Nashville, TN. Moore, I.D. 2001. Gravity flow sewers: modelling to capture limit states for buried thermoplastic pipes, Computer Methods and Advances in Geomechanics, Ed: C.S. Desai, Tucson Arizona, pp. 49-56. Dhar, A.S., Moore, I.D. and McGrath, T.J. 2002. "Evaluation of simplified design methods for buried thermoplastic pipe", Proc. of Pipelines 2002, "Beneath our feet: Challenges and Solutions", American Society of Civil Engineers, Cleveland, OH, July, 11pp. Wong, S., Allouche, E.N., and Moore, I.D. 2002, "Long term monitoring and analysis of full scale concrete pipe test beds", Proc. of Pipelines 2002, "Beneath our feet: Challenges and Solutions", American Society of Civil Engineers, Cleveland, OH, July, 11pp. Law T.C.M. and Moore, I.D. 2002. "Kinematic response of damaged rigid sewer under earthload" Proc. of Annual Conference, Canadian Geotechnical Society, Niagara Falls, ON, October. Lapos B. and Moore, I.D. 2002. "Evaluation of the strength and deformation parameters of Olimag synthetic olivine" Proc. of Annual Conference, Canadian Geotechnical Society, Niagara Falls, ON, October. Law, T.C.M. and Moore, I.D. 2003. "Guidance on Design of Flexible Liners to Repair Structurally Compromised Gravity Flow Sewers", No Dig Conference, Las Vegas, March 30 - April 3, 2003. Mwanang'onze, M., Moore, I.D. and Green, M. 2003. "Coefficent of Thermal Expansion Characterization of Plain Polyethylene Pipe", Pipelines 2003 ASCE Baltimore. Hawlader, B.C., Lo, K.Y., and Moore, I.D. 2003. "Analysis of Tunnels in Shaly Rock Considering Three-dimensional Effects on Swelling", 56th Canadian Geotechnical Conference 2003 NAGS, Winnipeg, MB, September. Baumert, M.E., Allouche, E.N., Moore, I.D., 2004. "Drilling Mud Phenomena in Engineered HDD Installations", Underground Construction Technology International Conference & Exhibition UCT Trenchless Technical Symposium, January 13-15, 2004, Houston, TX. Lapos, B., Brachman, R.W.I., Moore, I.D., 2004. "Laboratory Measurements of Pulling Force and Ground Movement During a Pipe Bursting Test", NASTT, No-Dig March 22-24, 2004, New Orleans, Louisiana. Kennedy, M.J., Skinner, G.D., Moore, I.D., 2004. "Elastic Calculations of Limiting Mud Pressures to Control Hydrofracturing During HDD", NASTT, No-Dig, March 22 - 24, 2004, New Orleans, Louisiana. Lapos, B., Brachman, R.W.I., and Moore, I.D., 2004. "Laboratory Measurements of Pulling Force and Ground Movement During a Pipe Bursting Test", NASTT, NO-DIG 2004, New Orleans, Louisiana. Chehab, A.G., and Moore, I.D., 2004. "A Uniaxial Linear Viscoeleastic- Viscoplastic Model for High Density Polyethylene", 57th Canadian Geotechnical Conference, Oct 2004, Quebec. Kennedy, M.J., Skinner, G.D., and Moore, I.D., 2004. Limiting Drilling Slurry Pressures to Control Hydraulic Fracturing During HDD through Purely Cohesive Soil, 57th CGC Quebec, G15. 215 8pp. Lapos, B., Brachman, R.W.I., and Moore, I.D., 2004. "Replacement Pipe Deflections under Vertical Pressure", 57th Canadian Geotechnical Conference, Oct 2004, Quebec. Nkemitag, M, and Moore, I.D., 2004. Numerical Simulation of Ground Movements Caused by Pipe Bursting, 57th Canadian Geotechnical Conference, Oct 2004, Quebec. Allouche, E.N., Bainbridge, K. and Moore, I.D. 2005. "Laboratory Examination Of A Cured In Place Pressure Pipe Liner For Potable Water Distribution System", No- Dig 2005, Paper D-3-04, 10pp, Orlando, Florida. Kramer, G.J.E., and Moore, I.D., 2005. Finite Element Modelling of Tunnels in Swelling Rock, K.Y. Lo symposium, University of Western Ontario, July 7-8, 2005, Technical Session D, 37pp. Moore, I.D., 2005. "Buried Infrastructure Repair Using Liners", 11th ICSGE, Cairo, Egypt. Trickey, S.A., and Moore, I.D., 2005. Numerical Study of Frost-Induced Ring Fractures in Cast Iron Water Pipes, GeoSask 05, CGS GS 665, 8pp. Moore, I.D., Allouche, E.N., Baumert, M.E., 2006. "Investigations of Pipe Installation Using Directional Drilling", No Dig ISTT Brisbane 8pp. Cholewa, J., Brachman, R.W.I., Moore, I.D., 2006. "Influence of HDD Installation on the Stress-strain Response of HDPE Pipe", No Dig ISTT Brisbane, 8pp. Nkemitag, M. and Moore, I.D. 2006. Modeling burst head advance during static pipe bursting, Pipelines 2006, ASCE, paper 40854-15420, 8pp. Nkemitag, M., and Moore, I.D. 2006. Rational guidelines for expected ground disturbance during static pipe bursting through sand, Paper E-2-01, North American No-Dig 2006, Nashville, TN, 9pp. Brown, M.J.P., Fam, A. and Moore, I.D. 2007. Material characterization of a composite polymer liner for rehabilitation of pressure pipelines, No-Dig Conference, NASTT, San Diego paper E-1-02, 10pp. Chehab, A.G., and Moore, I.D., 2007. One-Dimensional Calculations for Axial Pullback Force Distributions in Pipes During Directional Drilling Installations, Ottawa Geo 2007, 043, 1148-1154. Elwood, D.E.Y., Moore, I.D., and Xia, H., 2007. Hydraulic Fracture Experiments iin a Frictional Material and Approximations for Maximum Allowable Mud Pressure., Ottawa Geo 2007, 1681-1688. Tan, Z. and Moore, I.D. 2007. Effect of backfill erosion on moments in buried rigid pipes, Transportation Research Board Annual Conference, Washington D.C. January, 29pp. Xia, H. and Moore, I.D., 2007. Discussion of Limiting Mud Pressure During Directional Drilling in Clays, CGC Ottawa Geo 2007 0-21, 1696-1701. Ye, J. and Moore, I.D., 2007. Laboratory Simulations to explore the Strength of Deeply Buried PVC Sewers under Vertical Risers, CGC Ottawa Geo 2007, 017, 1665 - 1672. Ampiah, N., Fam, A. and Moore, I.D. (2008) Wavy imperfections and the strength of cast-in-place pressure pipe linres, Pipelines 2008, ASCE, Atlanta GA, July 23-25, paper 6702, 1-pp. Chehab, A.G. and Moore, I.D. 2008. Axial force in pulled-into-place HDPE pipes during and after installation. 3rd Brazilian Conference on Trenchless Technology and 1st Latin America No-Dig, Sao Paolo, Brazil, 10pp. Chehab, A.G. and Moore, I.D. 2008. Polymer pipes in trenchless applications: HDPE pipe response during pulled in place installation, Geoamericas 2008 (The First Pan American Geosynthetics Conference & Exhibition), Cancun, Mexico, March 2-3, 10pp. Cholewa, J., Moore, I.D. and Brachman, R.W. 2008, Response of a PVC water pipe during concrete sewer replacement by bursting, North American Society for Trenchless Technology, 2008 No-Dig Conference & Exhibition, Dallas, Texas, April 27 - May 2, Paper E-3-04, 8pp. Kong, J., Martin, M., Moore, I.D. and Hong, H.P. (2008) Integration of Geographic Information System and probabalistic analysis for optimized pipe infrastructure decisions, Pipelines 2008, ASCE, Atlanta, GA, paper number 6900, 12pp. Moore I.D. 2008. Advances in modeling of trenchless pipe installation and repair, The 12th International Conference of International Association for Computer Methods and Advances in Geomechanics (IACMAG), Goa, India, 1-6 October, 8pp. Moore, I.D. 2008. Assessment of damage to rigid sewer pipes and erosion voids in the soil, and implications for design of liners, North American Society for Trenchless Technology, 2008 No-Dig Conference & Exhibition, Dallas, Texas, Paper C-2-01, April 27 - May 2, 8pp. Moore, I.D. 2008. (Keynote Address), Pipe rehabilitation: effect of damage to existing pipes and design of pipe repairs, Trenchless Australia 2008, 7th National ASTT National Conference and Exhibition, 2-5 March, 12pp. Moore, I.D. 2008. Studies of buried pipe behaviour, Structures and Granular Solids: From Scientific Principles to Engineering Applications (Conference in celebration of the 60th Birthday of Professor J. Michael Rotter), Edinburgh, Scotland, 8pp. Balkaya, Müge, and Moore, Ian D. 2009. Analysis of a gasketed PVC pipe-joint, Transportation Research Board Annual Conference, Washington D.C. Paper No. 09-3101, 22pp. El-Taher, M. and Moore, I.D. 2009. Stability of deteriorated metal culverts including the effect of soil erosion, International No-Dig Conference, Toronto, Ontario, April, Paper F-4-03, 10pp. Elwood, D. and Moore, I.D. 2009. Hydraulic fracture experiments in sand and gravel and approximations for maximum allowable mud pressure, International No-Dig Conference, Toronto, Ontario, April, 10pp. Mak, Andrea C., Brachman, Richard W.I., and Moore, Ian D. 2009. Measured response of a deeply corrugated box culvert to three dimensional surface loads, Transportation Research Board Annual Conference, Washington D.C. Paper No. 09-3016, 14pp. Sarai, M.S., Moore, I.D. and Take, W.A. 2010. Jointed pipeline subjected to differential ground movements. International No-Dig 2010, 28th International Conference and Exhibition, International Society of Trenchless Technology, Singapore,November, paper 43, 7pp. Take, W.A., Sarai, M.S., and Moore, I.D. 2010. Moments in deteriorated cast iron pipes resulting from differential ground movement. Annual conference of the Canadian Geotechnical Society, Calgary, September. Elshimi, T.M., Mak, A.C., Brachman, R.W.I., and Moore, I.D. 2011. Behaviour of a deep-corrugated large-span box culvert during backfilling, PanAm Canadian Geotechnical Conference, Toronto, Canada, 7pp. El Taher, M. and Moore, I.D. 2011. Effect of wall corrosion and backfill erosion on the strength of deteriorated metal culverts, Paper 3C-5, International No-Dig 2011, 29thInternational conference and exhibition, Berlin, Germany,2-5 May, 10pp. Moore, I.D., Brachman, R.W.I., Elshimi, T. and Rahman, K. 2011. 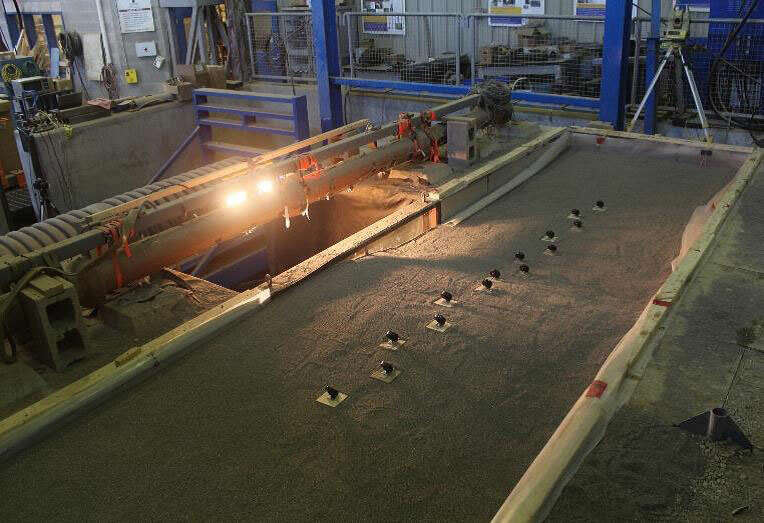 Analysis and testing to characterize the strength of buried infrastructure, IACMAG 2011, Melbourne, Australia, May. Rahman, K., Moore, I.D. and Brachman, R.W.I. 2011. Numerical analysis of the response of adjacent pipelines during static pipe bursting, Paper A-4-03, No-Dig 2011, Washington DC, March. 10pp. Almahakeri, M., Fam, A. and Moore, I.D. 2012. The flexural behavior of buried steel & composite pipes pulled relative to dense sand: experimental & numerical investigation, 9th Int. Conf. on Pipelines IPC2012, Calgary, AB, Canada IPC 2012-90158, 9pp. Mai, V.T., Hoult, N.A. and Moore, I.D. 2012. Assessment of Corroded Corrugated Steel Culverts using Field Data, NoDig 2012, North Am. Soc. Of Trenchless Tech., Nashville, TN, Paper A-4-03, 10pp. Moore, I.D. 2012. Keynote: Large-scale laboratory experiments to advance the design and performance of buried pipe infrastructure, 2nd International Conference on Pipelines and Trenchless Technology, Wuhan, China, 11pp. Moore, I.D. 2012. New AASHTO Design Methods for Polymer Drains, GeoAmericas 2012, Second Pan American Geosynthetics Conference & Exhibition, Lima, Peru, 10pp. Moore, I.D. and Brachman, R.W.I. 2012. 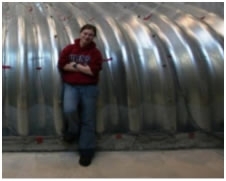 Keynote: Research advancing the design of large span deep corrugated metal culverts, II European Conference, Buried Flexible Steel Structures, Rydzyna 23-24.04.2012, 11pp. Becerril García, D. and Moore, I.D. 2013. Behavior of Bell and Spigot Joints in Buried Reinforced Concrete Pipelines, TRB Annual meeting, Washington D.C.
Becerril García, D. and Moore, I.D. 2013. Response of bell and spigot joints in culverts under vehicle load, ICPTT 13, October 16-18, Xi’an, China, 10pp, doi: 10.1061/9780784413142.119. Mai, V.T., Moore, I.D. and Hoult, N.A. 2013. Strength of deteriorated metal culverts, International No-Dig Conference, Sydney, Australia. Simpson, B., Hoult, N.A. and Moore, I.D. 2013. Experimental Investigation of a Rehabilitated Corrugated Metal Culvert under Surface Loading, NoDig 2013, Sacramento, CA, March 3-6, Paper WM-T3-05, 9pp. Wang, Y. and Moore, I.D. 2013. Structural design equations for bell and spigot joints in culverts under vehicle load, ICPTT, October 16-18, Xi’an, China, 10pp, doi: 10.1061/9780784413142.118. Becerril García, D. and Moore, I.D. 2014. Strength testing of deteriorated metal culverts with spray-on cementitious liners, International No-Dig Conference, Madrid, October, paper 132, 8pp. Brown, M., Moore, I.D. and Fam, A. 2014. Design recommendations for performance limits for cured in place liner in cast iron water pipe, NoDig 2014, Orlando, Florida, April, paper MM-T3-03, 10pp. MacDougall, K., Moore, I.D. and Hoult, N.A. 2014. Assessing the design of reinforced concrete pipes, Canadian Society for Civil Engineering 2014 General Conference, 11pp. Ni, P., Moore, I.D. and Take, W.A. 2014. Effect of ground fault hazards on continuous pipelines: an approximate design framework, Geohazards 6, Canadian Geotechnical Society Specialty Conference, Kingston, Ontario, 9pp. Ni, P., Moore, I.D. and Take, W.A. 2014. Normal fault induced ground deformations and the associated bending response of buried pipelines, 2nd European Conference on Earthquake Engineering and Seismology, Istanbul, August 25-29, 2014, 12pp. Ni, P., Moore, I.D. and Take, W.A. 2014. The Interaction of Normal Faults with Pipelines: Experimental Observation and Finite Element Modeling, Canadian Society for Civil Engineering 2014 General Conference, 10pp. Pyke, K., Kenny, S., Hawlader, B. and Moore, I.D. 2014. Effects of geohazards on energy pipelines: technology framework supporting engineering design and emerging tools, Geohazards 6, Canadian Geotechnical Society Specialty Conference, Kingston, Ontario, 9pp. Roy, K.. Hawlader, B., Kenny, S., and Moore, I.D. 2014. Finite element modelling of uplift and pipeline-soil interaction in dense sand, Geohazards 6, Canadian Geotechnical Society Specialty Conference, Kingston, Ontario, 10pp. Wilson, D., Filion, Y. and Moore, I.D. 2014. Development of a mechanistic, probabilistic model to predict the failure of large-diameter cast iron water mains. 16th Conference on Water Distribution Systems Analysis 2014, Bari, Italy, July 14-17, 8pp. Roy, K., Hawlader, B., Kenny, S., Moore, I.D. 2015. Effects of post-peak softening behavior of dense sand on lateral and upward displacement of buried pipelines, 34th International Conference on Ocean, Offshore and Arctic Engineering (OMAE2015), American Society of Mechanical Engineering, St. John's, Newfoundland, May 31 - June 5, paper 42138. Moore, I.D. and Doherty, I. 2016. Design of cementitious liners for repair of deteriorated metal culverts, Paper MA-T3-01, NoDig 2016, March 20-24, Gaylord Texan Convention Center, Dallas, Texas, 8pp. Lan, H. and Moore, I.D. 2016. Practical Criteria for Borehole Instability in Saturated Clay during Horizontal Directional Drilling, Paper TM2-T2-01, NoDig 2016, March 20-24, Gaylord Texan Convention Center, Dallas, Texas, 8pp. Becerril García, B., Cortés-Pérez, J. and Moore, I.D. 2016. Quality Control Testing of Joints in Gravity Flow Plastic Pipes, Proceedings of the 18th Plastic Pipes Conference, PPXVIII, September 12-14, 2016, Berlin, Germany. Moore, I.D., Regier, C. and Hoult, N.A. 2017. Surface Load Testing Of New Circular And Elliptical Metal Culverts At Shallow Cover, III European Conference on Buried Flexible Steel Structures, Rydzyna 24-25.04.2017, pages 219-227, DOI 10.21008/j.1897-4007.2017.23.20. Lan, H. and Moore, I.D. 2018. Practical Criteria for Borehole Instability in Sand during Horizontal Directional Drilling, Paper MA-T2-01, NoDig 2018, North American Society of Trenchless Technology, Palm Springs. 11pp. Editor (with Becker), Canadian Foundation Engineering Manual (Fourth Edition), 2006. Associate Editor, ASCE Journal of Pipeline Systems Engineering and Practice, 2009 - present. Associate Editor, Royal Society Open Science, 2014 – present. Member, Editorial Board, Tunneling and Underground Space Technology , 2011 - 2013. Committee F17 on Plastic Pipe Products, 1994 - present. Member, Committee AFS40 on Soil-Structure interaction, 1995 - 2004, 2010 - present. Member, Committee AFF70 on Hydraulic Drainage Structures, 2005 - present. 2017 Osterberg Lecture, Department of Civil and Environmental Engineering, Northwestern University, Chicago. Editor’s choice, May 2015, Wang and Moore 2015. Simplified design equations for rigid pipe joints based on the 2-pipe approximation, Canadian Geotechnical Journal, Vol. 52, No. 5, pp. 626-637, doi: 10.1139/cgj-2013-007. Honourable mention for the Gzowski Medal, Canadian Society for Civil Engineering, paper titled “Brachman, R.W.I., McLeod, H.A., Moore, I.D. and Take, A.W. 2010. Three-dimensional ground displacements from static pipe bursting in stiff clay, Canadian Geotechnical J., Vol. 47(4), pp. 439-450”. The RM Quigley Award of the Canadian Geotechnical Society for the paper titled “Brachman, R.W.I., McLeod, H.A., Moore, I.D. and Take, A.W. 2010. Three-dimensional ground displacements from static pipe bursting in stiff clay, Canadian Geotechnical J., Vol. 47(4), pp. 439-450”. Honourable mention for the Casimir Gzowski Medal of the Canadian Society for Civil Engineering, for paper entitled "The performance of a laboratory facility for evaluating the structural response of small-diameter buried pipes", by Brachman, R.W.I, Moore, I.D. and Rowe, R.K.
Best paper award, North American Society for Trenchless Technology for rehabilitation paper titled "Tests for pipe liner stability: What we can and cannot learn"
Colloquium Speaker, Canadian Geotechnical Society Annual Conference "Culverts and buried pipelines: Geotechnical issues affecting design and performance"
Alfred Noble Prize of the ASCE, ASME, IEEE, AAEG for paper titled "Response of buried cylinders to surface loads"
Effect of differential ground motion on gravity flow and pressure pipes. Outline: Most pipe design focusses on the two-dimensional response around the pipe barrel. However, various circumstances arise where differential ground motion along the pipe axis leads to longitudinal bending that can jeopardize the structural capacity of the soil-pipe system. Testing has been used to establish how flexural stiffness of the pipe influences the bending moments that arise where a pipe spans across a normal ground fault, and the performance of plain and corrugated thermoplastic pipes, steel, and glass fibre reinforced polymer pipes under differential ground motion. Funding: NSERC Strategic Research Grant, Clean Water Works (previously, NSERC Strategic and Discovery Grants, 407 ETR, City of Hamilton). Collaborators: A. Take, N. Hoult (formerly A. Fam and S. Kenny). Students: M. Saiyar (PhD, 2011), M. Almahakeri (PhD, 2013), A. Burnett (MASc, 2015), P. Ni (PhD, 2016), M. Zhou (PhD, 2017), H. Williams (MASc, in progress). Effect of erosion voids on performance of gravity flow pipes. Outline: Leakage of pipe joints or perforation due to corrosion or fractures leads to ingress of groundwater which may erode the surrounding backfill. The loss of sidefill has been studied using full scale experiments with erosion voids, as well as finite element analyses. Past work has established that erosion voids compromise the strength of rigid and flexible pipes, as well as the stability of the ground surface above shallow buried structures. Laboratory testing and nonlinear analysis is being used to understand how stability is influenced by erosion voids in the vicinity of the buried sewer pipe, as well as vehicle loads. Testing has also been used to investigate the extent to which grouting restores the structural capacity of the soil-pipe system. Funding: NSERC Strategic Research Grant (previously, NSERC Discovery Grant and the US DOTs through the National Collaborative Highway Research Program). Students: Z. Tan (MASc, 2007), J. Peter (PhD, in progress), V. Mai (PhD, in progress), T. Monteith (MASc, in progress), O. Kearns (MASc, in progress), S. Shaver (PhD, in progress). Stability of Liners Used to Repair Damaged Culverts, Sewers and Water Pipes. Outline: Polymer liners fitted within damaged sewers respond to external fluid loads, and to changes in earth loads as a result of vehicle loads on the ground surface or deterioration of the backfill in the vicinity of the buried structure. Past work has established the role of damaged pipe and liner geometry on both resistance to buckling under external fluid pressures, and local bending under external earth pressures. Laboratory testing and nonlinear analysis is being used to understand how stability is influenced by erosion voids in the vicinity of the buried sewer pipe, as well as vehicle loads. Limit states have been investigated for water and gas supply pipes repaired using cast in place liners, considering the influence of internal pressure, ground movements and soil-pipe-liner interaction. Work has been conducted examining the strength limit states for sprayed cementitious liners, grouted slip-liners, repair by paving the invert, and cured in place polymer liners. Experiments are being used to collect physical evidence on these limit states, and design models have been and continue to be developed to guide consultants selecting liner thickness and other aspects of the rehabilitation. Collaborators : R. Brachman and N. Hoult; Past collaborators: A. Fam, E. Allouche. Students: K. El Sawy (PhD, 1996), J. Lee (MSc, 2002) , M. Law (PhD, 2004), N. Ampiah (MSc, 2008), D. Becerril García (Postdoc, 2013), V. Mai (MASc, 2013), C. Regier (MASc, 2015), J. Tetreault (MASc, 2016), J. Peter (PhD, in progress), R. Cichocki (MASc, in progress), J. Treitz (MASc, in progress), M. Brown (PhD, in progress), T. Adebola (PhD, in progress), E. Rudyck (MASc, in progress). Outline: Analytical and experimental work is being used to understand stability limit states for buried cast iron pipes responding to frost loads. Thermo-viscoelastic analysis has been developed for HDPE to permit calculation of temperature-induced deformations or stresses. Three dimensional finite element analyses has been used to examine cast iron pipe damage as a result of differential ground movements caused by different levels of frost susceptibility. Fieldwork is linking frost heave at the ground surface measured using Lidar, to location of leaks, and subsequent development of ring fractures. Laboratory assessments are investigating the role of pitting corrosion and other stress concentrations of flexural capacity of pipe segments. Outline: Reinforced concrete, vitrified clay, corrugated steel, and thermoplastic pipes used for stormwater sewers, highway culverts and water supply are fitted with a variety of mechanical and pressure rated couplings, and the performance of these joints often controls the service life of these structures. The design of these couplings depends on the interaction of the two pipes, as well as the mechanical coupler and/or rubber gasket. Full scale experiments, finite element analysis, and closed form analysis have been and are being used to explain coupling behaviour, and develop rational design procedures for these systems. Funding: NSERC Strategic Research Grant (past funding: NSERC Discovery Grant, Ipex, US DOTs through the National Collaborative Highway Research Program). Outline: Horizontal directional drilling involves opening of a pilot hole using a horizontally directed drilling rig, hole expansion using a back-reamer, and pulling into place of a new HDPE pipe. Field measurements and finite element modeling are being used to investigate pulling forces on HDPE pipes pulled-into-place. Finite element studies are examining both blowout and brittle fracture of soil surrounding the borehole due to excessive mud pressures. Outline: Pipe bursting involves expansion to break and displace existing brittle pipes, and pulling into place of a replacement HDPE pressure pipe. Analysis of the cavity expansion and contraction is being used to investigate radial pressures on the HDPE replacement pipe to permit estimation of pulling forces, peak stresses and maximum pulling lengths. Outline: Laboratory testing to define limit states (local bending and local buckling), 2D and 3D finite element analysis and evaluations of published field studies are being used to develop design methods for high density polyethylene and polyvinyl chloride culvert products (being incorporated in the AASHTO Highway Bridge Design Code). Outline: Bulk solids are often removed from ore stockpiles using flexible metal or rigid concrete loadout tunnels. The design of the tunnels and the bulk-solids flow requires an assessment of earth pressures in and under the stockpiles. Finite element studies are being used to understand earth pressures during and after initial filling, unloading and refilling. Response of Silo Structures under Bulk Solid Loading. Outline: Work has been conducted to compute the loads on silos when filled with bulk solids, assess the buckling strength under the action of vertical shear loads (taking into consideration the stabilizing effects of the bulk solid), and determine the shell response resulting from non-uniform solid-shell friction properties. Clogging of Drainage Systems for Municipal Solid Waste Landfills. Outline: Work has been conducted to assess the impact of using large size gravel and large size perforations with plain HDPE leachate collection pipes to minimize biologically induced clogging. Testing and analysis was used to assess influence on local stresses in the HDPE pipe. Outline: Analysis of field tests (conducted by Selig et al at UMass) was used to evaluate the effectiveness of 2D and 3D finite element analyses for calculating metal and concrete culvert response to earth and live loads. Design methods for the AASHTO Highway Bridge Design Code were developed using a parametric study conducted using the analyses.